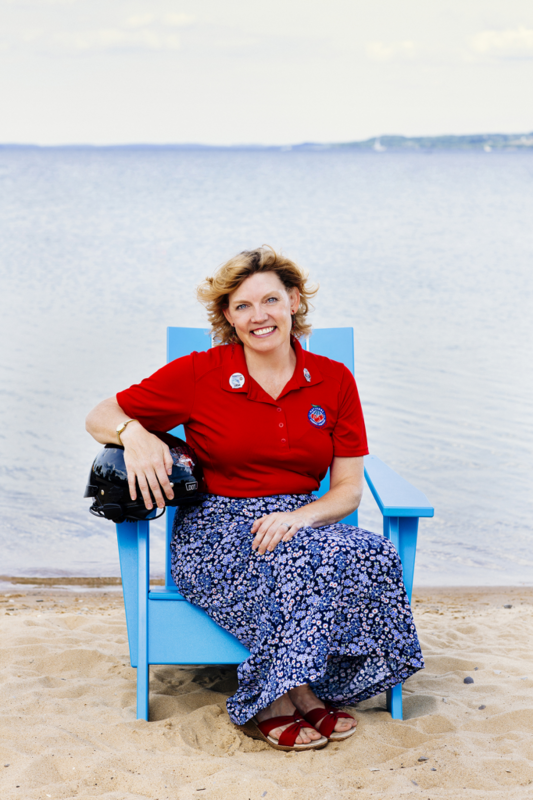 In this new blog series a Traverse City Tourism employee will be featured once a month. Each story provides an "inside" look at the people behind the scenes who promote the region and help make it an incredible destination. Read on and learn more about Traverse City from the people who live, work, and play here—all day every day! Tell us a little about what you do at Traverse City Tourism. I&apos;m the new Traverse City Visitor Center Manager. I supervise over 100 dedicated and knowledgeable volunteers. My job is to stay current on events in the area, keep track of restaurant and store changes and be knowledgeable about other attractions that would interest visitors. The volunteers and I are here to give advice on activities, driving directions, suggestions for dinner or hotel reservations. I manage the scheduling of the volunteers, arrange educational outings and oversee the maintenance of our building. I also oversee placement and procurement of over 400 brochure slots for local businesses. I am all about education and the power, self-confidence and self-esteem it can give you, especially when you share it with others. I&apos;ve had many jobs, and all have given me experience for what I do now. I learned customer service skills as a "Ball Boy," waitress, and bartender at Wildwood Lanes. I was an airline service agent and travel agent. I was an office temp and even got to dress up as several costumed characters. I worked 24 years as a cashier at Meijer and was "loaned" out to every department. In 2009, I went back to school with my wonderful family&apos;s support and earned my Associates degree. This led to a two-year stint as a Volunteer Management intern at the National Cherry Festival and four years (and counting) as an Event Director for them. All of this—combined with the fact I&apos;ve lived in Traverse City practically my whole life—gives me special insight about everything the area has to offer. I know where everything used to be and what&apos;s there now! Traverse City has been wonderful to me and I hope in my present job I can return the favor. Every day I look forward to telling people about my home town. The entire Traverse area has something to offer everyone. I find out what each person is interested in doing and match it with things we have to offer. I want people who visit to fully experience the town and love it as much as I do! My husband Mike and I prefer local restaurants as opposed to the chains. We go out for breakfast more than dinner. He used to work at Round&apos;s Circle Inn so we eat there a lot, but we also like Randy&apos;s Diner, Sparky&apos;s Diner, Willie&apos;s Rear, and the Happy Hogg Café. For special dinners we go to Sorellina, Copper Falls, or Boone&apos;s Long Lake Inn. For takeout we do The Kitchen, Taco House, That&apos;s a Pizza, and Peegeo&apos;s. We love the Grand Traverse Mall&apos;s Teriyaki Express bourbon and sesame chicken, too! Our favorite attraction is, of course, the water and all of the beautiful views and recreation it offers. I don&apos;t really have a favorite destination (well, maybe Lola&apos;s!). When you have a Harley it&apos;s not about the destination; it’s all about the ride. What’s your favorite downtown lunch spot and why? I enjoy meeting up with friends at The Greenhouse Cafe, The Dish, Little Fleet, and J&S Hamburg. All of these places have a great lunch menu and are easy to dine at in an hour or less. How you would you describe Traverse City to a first time visitor? I tell them it&apos;s a beautiful, small town with all of the activities, restaurants, culture and events usually only found in big cities. You can do everything or nothing at all! It&apos;s like Heaven, only without the Pearly Gates! The perfect day starts out with jumping on the motorcycle. We ride towards East Bay and head to Old Mission Lighthouse to watch the sun come up. Then we’d go down Peninsula Drive, follow M-37 to West Bay and jump on M-22. We’d have lunch at Boone&apos;s Prime Time Inn in Suttons Bay, catch M-204 to Lake Leelanau and do taste samples at Northern Latitudes Distillery. Get back on the bike and head to M-22, then M-109 for the Pierce Stocking Drive. After taking in all 12 breathtaking vistas we’d head back to M-22 to watch the sun set on Empire Beach, then it’s homeward bound to park the bike. We&apos;d call for a pick up order of pizza at Peegeo&apos;s then walk back home, pull out lawn chairs and listen to the (NASCAR) Night Race at Bristol (with our favorite driver winning, of course!) chewing on a slice of Mike’s Sicilian. Yup, that&apos;s the perfect day!! The band Journey would be really cool to run into down at the Open Space! After spending time in our beautiful and unique "City By the Bay" they&apos;d forget all about theirs! Then I’d have them listen to the Traverse City song “Take Me There” from The Hackey Turtles. That would be awesome!! Can anything beat summertime!?! Having the warm sun on my face makes me happy. I love going to all of the festivals, fairs and events that weren&apos;t around when I was a kid growing up in the "boonies" of West Silver Lake Road. Some of my most memorable times in Traverse City have to do with music or the Cherry Festival and include: -I’ve been lucky to get backstage passes for both Interlochen and the National Cherry Festival concerts for several acts including Faith Hill, Montgomery Gentry, Joe Diffie, and Uncle Kracker. -At their concert in Interlochen, Randy Owen from Alabama came down and talked to our daughter because she kept waving at him and blowing him kisses. She made him sing “Angels Among Us” just for her. She was only 5! -I was in a downtown club when Kid Rock came in and started a jam session.